Published by: Great Joy Publications Carryduff, Belfast, BT8 8DN. A world-wide group claims to be THE descendants of the first Christians spoken of in Acts. They claim to be THE holders of the Holy Spirit, and draw a great border between themselves and what they term the 'religious' world which they collectively downgrade, and the 'world'. Workers go out two by two, claim denial of material possessions, and do it "just like it says," say followers in serious earnest. Only the Bible is ever preached from. Said one worker from England regarding the Bible, "We don't sugar coat it for the young or emulsify it for the old." Threaded throughout this total Bible emphasis, adherents of the n o-name approach liberally use the phrase "the truth". Much later, a new adherent may discover they are referring to themselves as "the truth" — as though it was the name of the no-name group. It is the abuse of the word "truth" that is the key to uncovering serious errors in what, on the surface, appears to be a practically flawless, ever-harmonious group which enacts out the scenarios of the first Christians as depicted in the New Testament with extraordinary skill and devotion. The precious Gospel!" exclaimed a female worker out of the blue, as we drove away from a high rise apartment complex in the suburbs of Oslo, Norway. She had just addressed a Wednesday night Gospel Meeting. Later, this same worker wrote in a letter that a certain elderly lady was "…the only one who had heard the Gospel," in a vast geographical area of Norway. A picture flashed of the elderly lady, dwelling amidst all kinds of denominations as well as those members of the state church which is Lutheran. One person had heard...I was puzzled. The workers are particularly fond of verses having to do with "hearing" the Gospel (1 ). They seem to portray themselves as THE embodiment of the Gospel message on earth. That unless they utter the lessons of the Gospel, it is somehow invalid. One worker, from England, however, was heard to remark with incredulity that there may be others (Christians) that are not of this fold (i.e. meaning THE fold--the no-name group). His reference was to the group's favored John 10, especially verse 1. 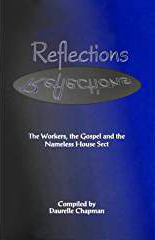 The world as seen through many workers' eyes is just that — the world, running after "false gospels" or, as they prefer to say, "counterfeit gospels". The word "Gospel" is said as though it was their exclusive property, a word to be embraced lovingly and intimately. Since most people in the western world won't insult their intelligence to not having heard about the Gospels, there are occasions in Norway where no one comes, in response to Gospel Meeting invitations which have been placed in mail boxes. Yet, for reasons unknown, Norway seems to be a place where workers like to be. One female worker hearing the authorities were going to revoke her stay here (since she had been in another country for a time) reportedly wept at the Foreign Police office; she got to stay on. There are frequent meetings amongst just workers, and, in this opinion, these meetings serve to launch them further into a specific "spiritual world" in which they, and lay members, seem to be a part of. The "spiritual world" supports, gives rich sustenance, and is so absorbing that workers are agreeably sustained through all the rejections and non-compliance of the "world". The unison of belief among workers, the exacting similarity from one to the other from many, many countries, I at first attributed to Luke 6:40 "…every one when he is fully taught will be like his teacher." Then this astounding similarity and singular devotion to their "world" which they all explain away is because they have THE right, THE one true HOLY SPIRIT, began to arouse doubts. In this perspective, seeing the limited few who have taken this on in Norway in the last two years (1984-1986), one would think reason would make the workers cut their numbers. Instead Z- worker was engaged in dealings with authorities for permission for more workers to come in. One may ask: what 'work' could these people do? Yet devotees (especially those raised in this) seem keen on getting money together to support a worker out in the field somewhere to spread the Gospel. Any kind of mechanical means used by others e.g. television, radio is anathema. To the no- name group, the Gospel must be personally "heard" — thus, the great push to get workers out. Word of mouth, the quiet Christian example, pricking peoples' curiosity by being pleasantly 'different' — is the credo. There appears almost pride in Z-worker's voice in describing how quiet they are, absent of all the clamor that many religious groups resort to. Conventions, he says, have been held in some towns for decades, and few (outside of the group) even know these conventions are taking place. They appear an invincible army, united in a rigid single­-m indedness that is hard to define. This common denominator of harm onious unison evidenced in those met, both men and women of many nationalities, they would cheerfully note came about because they are all "in the truth". The Bible is their stage; their greatest intimacies are shared with persons portrayed throughout the Old and New Testaments. A constant theme is the way is hard into eternal life; prepare. Their dress is meticulous and dignified. Female workers would be adorned with long hair; no slacks or clothes that even hinted of a relaxed spontaneousness would ever be worn. They reportedly make the supreme sacrifice as far as worldly goods and the enticements the world has to offer are concerned. Television is shunned, few have seen any films, and preoccupation with current, worldly events is generally minimal or non-existent (this is often the case with lay members, as well). By taking on the worker role they say no to marriage and family. No divorced person can become a worker. As a prerequisite, they own no land, property, and claim money is just for daily needs. Adjectives to describe them are all positive: ever-gracious, polite; exceedingly respectful to persons and property; loving; kind; not given to offend; reliable; honest; often meek, and ever-pleasant. For personal life-standards all are in complete compatibility with what the Bible teaches on the highest Christian character traits. I have never heard of any worker found in a situation that would compromise what he or she represented in their capacity as workers. Many are from rural backgrounds and most I have met were raised in what one or both of their parents called "the truth". Sharp distinctions were there for them from childhood on. They were the "true Christians", the rightful inheritors of the one faith, one hope, one baptism, one spirit maintained through the ages from the time of the first Acts Christians by itinerant preachers going out two by two, in poverty, preaching the one, true gospel. The rest of the world was either bad, or chasing after counterfeit gospels, calling themselves 'religious' and worshipping in the greatest anathema of all, church buildings. From this observation, how they came to be workers is sometimes a personal decision or strong inclination to be one. One worker remarked that some of the new ones don't necessarily know the Bible so well, it is just that, to paraphrase, they know "the truth" and can communicate it. Then there are reportedly elders in each area who make judgments as to whether these individuals are adequately prepared to withstand the rigors of missionary life. They claim no headquarters or organization. It is the harmonious guiding they receive from above that makes all fall into place, they say. Yet, the organization is clearly evident. They take expensive air flights to distant lands to attend conventions and the adherents in the host country are well aware they are coming and have visiting workers' names already printed up on programs. 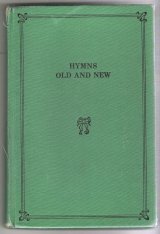 There are meetings in different countries to revise what appears to be a universal hymnbook; Bible study sheets of what is being studied world-wide each Wednesday evening are handed out at a precise time of the year. The homeless, two by two preacher concept becomes a shade lack lustre when one realizes they have regular conclaves of worker meetings, all organized (in which perhaps newcomers to the group are also discussed) to which workers in a country must sometimes travel long distances by train, car, etc. In Norway, they take no employment, lead frugal lives, but seem to have a strong back-up system that would never leave them to chance food and lodging or in being at the mercy of "kind" strangers. A point of pride is that they never take collections. But to expand further, that is because they want all of a person. When this person is deep into the group, they are in a sense 'family' which allows for greater latitude than in a one-hour-in-a-church-plus collection set up. They claim no membership situation either. A person is either in and doing it — or trying to do it — or they are 'out', but if they reform they can come back in again. Speaking in meetings held throughout the year every Wednesday and Sunday, the workers use no notes, hold the Bible and claim to speak "in the Spirit". The Lord's Prayer they would not use because it is rote memorized and not "from the heart". They like to say the heart is what directs them in spontaneous prayer, of course, with God guiding and "in the Spirit". One worker made the claim that for them to address God as ''Father" had greatest meaning, but for the 'religious' world to use that title, was just in vain. To be said in near-praise of the no-name group, they have­ world-over it appears -- formed a "body" where many of the Bible's verses regarding Christian character are not only applicable, but find a most excellent expression. In my long years of observing Christian groups, particularly in the US, I have never seen this excellence attained as I have witnessed in the no-name group. They graciously accept kindnesses from one another without building stumbling blocks to these kindnesses as I have seen so many do who were members of churches. There is a loving dignity behind the actions of many. In fact, the principle of love among several is an admiration. In my initial exposure, it began to "work" that passages in the New Testament, those particularly dealing with life style, did not have to remain "dark" anymore. There came enthusiasm over this, and added to it were several workers who volunteered how "God's servants" first appeared to them or their antecedents. One very gentle and beautifully reverent female worker, described how, many years ago, her mother had prayed to God asking where were these people who spoke the Gospel in the manner told of in the New Testament. A few days later, two workers appeared at their farm on the prairies of Canada. Variations of this story could be heard — particularly from the farm-raised Canadians. Hence comes the strong stance that they can ferret out all spiritual need in any geographical area world over, as "God directs". Being bombarded with this impressive new enacting out of the life style, there was, coupled with this, the regular reminding that they are the bearers of the true Gospel message from New Testament times. This latter point is a weighty matter and all seem firmly convinced this is the case. Yet, in asking questions to various ones (particularly workers) no one can go back much before 1910 with it. No one claimed a great-great grandparent had passed it on, for example. Norway's no-name group appears to go back no further than the 1920s. A member in South America recently wrote that a group is just getting started in the huge city of Caracas. 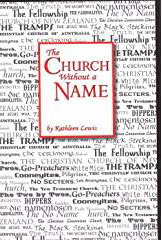 Try as I might, in asking individuals from as many countries as possible, no one seems to be descended from an older remnant of the no-name group — an absolute necessity, in this opinion, in order to make claims that they have threaded their way through the centuries as bearers of "the truth" from New Testament times. "How did the word get communicated in the Middle Ages," I asked, "when a lot of people did not read?" Their answer was they "heard" workers speaking the parables, and applied them to their lives. "We're not much different from the first Christians!" enthused a member in her early 30s. This member, in travels, has a chief purpose to first find the "friends", and she is armed with addresses. "The spirit is the same," is a common, matter-of-fact expression from those who come back from other countries where they have attended meetings. 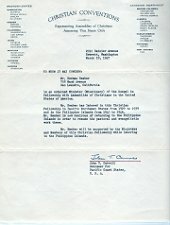 This only serves to re-enforce for many of the others, that they have been "chosen" for select membership in THE group. So rigid is this concept amongst them, there is — if one may c all it that — an air of "superiority" (this word is not used in the derogatory sense). Occasionally, workers will monitor what is going on in churches and come away pleasantly re-enforced that THE spirit is with them. This uniform, and strongly held conviction, plus the excellent stage they set for the enacting out of New Testament verses on the life style (plus the very intimacy, suggested by many, with persons mentioned in the Bible), makes them a formidable block of single mindedness when others outside, may wish to tap on their "door" out of curiosity, and maybe even genuine interest. What awaits the curious, is the picture of gradually enveloping a person over a long period of time, this person's honing down by workers of previously held religious convictions, 'til the person is a blank slate, a "child" ready to be remoulded in a pattern that — in this opinion — is firmly etched in uniformness onto the minds of workers world over. They know how they want the "flock" to be. Break that human will, seems to be top priority. And for this, they have Bible verses that serve to justify that purpose, chief of which is "taking up one's cross" which in the no-name group's interpretation is to subvert the human will, or, Jacob and Esau —"the elder shall serve the younger" (the older will shall serve the new, younger, will). On the positive side, they do give reasoned out concepts to verses like "laying up treasures in heaven" (this, to them, has to do with developing areas of worth in the self as 'treasures') but then it seems they must then downplay verses like "our righteousness is as filthy rags" (I have heard one worker mention this verse in a talk at a meeting). It's all Bible!" jubal newcomers, who are being eased along the path into the group. And that is true. At first, I rejoiced because in my years' long thirsting to meet up with people who go deeply into the Bible, it was most impressive to find frugal folk who do just that. (There is far too little rational, deep Bible study, I feel — study without the entrapments of having to follow some group's party line along with it). An itinerant teaching order, somewhat in the manner of Judaism's scholarly Hasidic group, was just what Christianity of today needs, I said to myself time and time again. Yet, it became clearer and clearer they want to see themselves as "sent from God" (although a few workers have emphasized to me they are "only humans"), with the right and privilege to re-mold individuals so that they can be satisfactory, obedient members of their "flocks". The initial enthusiasm eventually turned to questioning, then to doubting, and finally, over two years later, to a sweeping rejection of something, which in many of its parts, is a beautiful, much- needed advancement towards more excellence in Christian worship. "But we beseech you, brethren, to respect those who labour among you and are over you in the Lord and admonish you. 13 and to esteem them very highly in love because of their work" (1 Thess. 5:12-13). In this experience, workers showed up, in twos, in an unannounced manner. They brought positive, intangibles to the atmosphere but their strong, "other world" inclinations maybe left an unrest that at first disguised itself as peace. After frequent visits from Z-worker, there were inner changes too abstract to verbally define (like inner moving wind currents, and continual readjusting from moment to moment ....) I particularly recall wanting to go nowhere — almost being unable to go anywhere outside of the grocery store. Life had become a wait for workers' visits and meetings. People not in the group began to turn on a jaded look, as though the only real people were the group's adherents. One member, for years (of many members world over who do the same) has had workers in the home giving them food and lodging for months at a time. This member evidences a real insecurity and actual fear about being judged unfit for the eternal kingdom. It is this perennial insecurity that plays at this member instilling an attitude to "give the workers the best I have got (in goods)." This person, who buys them clothes on occasion, too, asserts, "The workers must have as good a quality clothes as what we wear." The member feels one must fight hard to remain up to the standards which the workers, in their gracious silence, seem to set. "One must struggle always to be with them," the member says in near exasperation for having tried — in gargantuan proportions — for years — to be a suitable believer, and host in their eyes. "This is the truth," the person claims flatly. "Outside of this, the only choice is to be a child of the world." Yet, admittedly this member has been on the brink of psychological crisis several times over "the truth". In one letter, this person wrote, "I know it is the truth but…"
When asked one day, "What is the truth?" the member replied, "Going out, two by two, owning no property, telling the Gospel." "The truth is life style then?" "Yes," the member replied without hesitation. Summing it up, a worker said of this member, that this member "....will do anything for you." To the uninvolved observer, a question might crop up as to how much telling of the Gospel message many of these workers do in a year. Yet real activism — getting out — does not appear to be the highest daily priority. Workers and lay people alike have been told that the times alone are valuable, soul-working, preparing times. And they emphasize, particularly to newcomers, Matthew 25 which says — first and foremost — be prepared. As one elderly worker succinctly put it, "I am concerned about my own soul." There is no encouragement to do charitable work in "the world". Their argument rests with the idea to stay home, prepare that "other self' (there is a definite distinction here — two "selves" they are always dealing with ...) for eternity. This is to the virtual exclusion of helping others outside the group. That is dismissed, as social, human-type activity, 'nice' but it yields no return in the Christian-eternal salvation sense. (This writer was mentally confronted time and again with Christ's clear statement about who the neighbor was — and this is one part of the Gospels that in my limited experience with them, seems to be grossly overlooked). In short, adherents keep a low profile where Christian service projects are generally involved. It has been drummed into them as wasted effort in this "short life" which should be geared to preparing. Workers' presences are frequent reminders to the lay people of that, and that in order for "the work" to continue, there must be willingness to give financial support and food and lodging. About this latter point, there is real caution evidenced by the workers. Only those "tried and true" members generally participate in this; the commitment on the part of members has to be long in evidence. At least two members have said that in their days of learning when they were not quite "in", they sent money to workers and it was promptly returned. One member said she cried a lot when her money was returned, but went on to conform to the workers' re-molding process. In this opinion, their concept to entry into this fellowship is to become like a child, and by various "nice" but firm ways and means this "child's" will has to be broken. "The elder will shall serve the younger" it is emphasized — and any newcomer is a "child" in their collective eyes, regardless of how old he or she is. Finally, when asking a member if it wasn't hard to have workers living in the family home for long periods of time, the member responded, "Well, if a person can't stand heaven on earth (meaning the workers' presences), how can they adjust to life in the heavenly kingdom?" The Islamic world has its religious pilgrimages to Mecca, the Jewish peoples, their well-defined holy days and good access to scholarly teachers, but Christians — they are left in such a fragmented state. There are burgeoning denominations and sects all over, but no real place to focus deeply on the Bible, its messages — in a rational atmosphere, with clear spiritual renewal as a goal, unless there is a 'hitch' — that is accepting some man-made props geared to bolster up everything in the name of the "true" Christian message. With this ever-cynical attitude, in the summer of 1984 I was guest at a convention of the no-name group having made no commitment nor had I been asked to. Parts were impressive i.e. the harmony, the caring and good feeling around, and the unity one felt with strangers. Yet, the props had to come....such as a worker sensing I was an "outsider" telling me that, "First, I was a Methodist, then I heard 'the truth'...Or a long-time member's conviction that one could never be sure of their salvation in this life ....that the race was to the finish, implying we always must dwell in an insecure state over whether we would be saved or not. This was a conviction, by the way, I did not hold at the time. Then there was the language. Every club and organization has to have its "in" language. I would have thought those claiming descendancy from the first Acts Christians would be above such things; not so. Vocabulary included such words as "professing", "made my choice,", and "in the truth". 'Professing' was particularly abused, and it was found irritating to be asked: "Are your parents professing?" (and the implication was that if they were not in the no-name group any membership in one of the 'churches" was invalid ...) or "Have you professed?" Obnoxious, I termed it. I had the same cold reaction to this as being hit up in some churches in the U.S. with questions like "Are you born again?" or "Are you saved?" — the answers to such questions could hardly edify the askers of the questions one way or the other. I left this first convention saying to myself, "It is nice for them…" but I felt they, too, missed the mark. If they had a name, it would be the Way Christians, noted one worker. As justification for this, they would probably refer to Acts 24:14, "But this I admit to you, that according to the Way, which they call a sect…"
One hears about the Way as though it was more a road or a specific inner spiritual highway, upon which adherents to the group travel. Heard about with the frequency of John 10 and Matt. 25 is Matt. 7:14, "For the gate is narrow and the way is hard, that leads to life, and those who find it are few." Any reference to the Way, in a meeting, is most acceptable subject matter, as individual lay members get up and say their revelations from Bible study and prayer over the previous week. Commonly, the workers like to say the calming, quiet meetings bring peace to the heart, in the fact of their all being together. The act of meeting quiets the heart and spirit, they say (apparently as refuge from a world which is on the attack, trying to bring constant inner unrest to these members of the group). For me, this has always been a point of question because I never stepped up to — nor wanted to — this plateau, many were on who felt the inner disturbances of "attacks" from worldly forces. This emphasis that primarily the only calming influences to growing turmoil and obstacles on the way, were meetings and 'fellowship' with each other, bothered me because it seemed to agitate in some a chronic nervousness (I am not nervous by nature, and do not want to be made to be ....). All this was subtle, not expressed, but one worker noted spontaneously once about all the peace one can feel after a meeting. This peace seemed sporadic and was linked with being in meetings especially for those in this for some years. In reasoning it out, I could not justify having nervous unrest as a life-long condition for having accepted this group's approach to the Bible. In this experience, have heard of two workers hospitalized for depression — nerve conditions for a several month period. One member summed up the illness of one saying that there was no alternative because the worker "knew it was 'the truth' ". Another sickly male worker, virtually bed ridden, got up and travelled some 45 minutes to a meeting. Some are so tied to meetings it seems to be their life's blood. As one enthusiastic lay adherent from Australia described what was to me a chaining influence, "It (meaning, for him, the Holy Spirit) won't let you go!" (meaning, will not release you). Thus this pull to get to meetings in any and all circumstances. The meetings which are supposed to do such wonders for group adherents forced to live out in the 'world' for most of the week, left me with mixed reactions. All talk was from the Bible, and that was a positive. However, one long-time member seemed to see life as a grieving journey, where after the meeting, the next day she would "take up the struggle" to go on the way. These adherents in various stages of 'purification' do not collectively paint much of a picture of Christian joy or confident hope. It was Z-worker who made it clear that he thinks the Bible is only valid within the context of this group's use of it. I do not know if this idea is collectively shared by all workers, however I had asked what about the millions of people who are seriously reading the Bible with the hope to come to salvation...people who may never have heard of this group.
" Well, people read the Bible for comfort," he dismissed. "You mean they are wasting their time then?" He shrugged, indicating to me that is what he thought. How serious a thing it is, in this opinion, for one group to claim the universal Holy Scriptures meant for mankind through all the generations, as exclusively its own. By some of these people in the no-name group equating themselves to "the truth", don't they call themselves into serious question? Could it be that some of these believing these ideas are living instead, a great deception? As he made references to the way, and the "narrow way" — and tried to incite worry over preparing for eternal life, Z-worker set his hat regularly over a Bible displayed in my home. This was his silent way of saying I wasn't "doing it right". The procedure stopped after some weeks, perhaps around the time I exhaustively looked up every reference to the way in the Bible — and seemed a candidate for going 'their' way. "Count the cost," said Z-worker during one of his visits, eyeing me inquisitively from his seat in my living room. I hardly knew what to make of it. First, I'd come some months before from the US where one of the country's most known evangelists used the same phrase frequently over T.V. Secondly, I had thought I had explained to Z-worker my personal commitment to follow Christ some 15 years previous. It was then I counted the cost, and the phrase was not new. But Z-worker, although keen to "listen" in those conversations, seems now, as I look back on it, not to have "listened" much at all. The workers have a re-moulding pattern, and that is a fixation. They lay great emphasis upon "hearing" them to the exclusion (to their great detriment in this opinion) of "hearing" the growing chorus of genuine Christian voices out in a world that has been exposed to the Christian message for 2,000 years. It is a pattern used over and over by workers, yet each newcomer is made to feel he or she was called out, "drawn by God" to get this foretaste of heaven by experiencing life in the no-name group. They do the converting; they hold the keys into this exclusive fellowship that is grooming its individuals for eternal life. One worker noted as I was preparing for baptism at the third convention, how so few get into this, implying that they were passed by — nice people, good people...and somehow they did not make it .... leaving me to sense her perceived doubts about how I got to the "door" of the fellowship when much better folk had been passed over. There are those who leave, or just don't show up at meetings and conventions anymore. They are thus relegated in the groups' unexpressed opinion and often in their own, to a nether world in which they have no Christian hope, and can be part of nothing that has anything to do with Christianity. The latter stance is particularly the case with those raised in this group's philosophy, or who sometime in childhood had a parent who embraced it. These individuals have it particularly difficult because they have been so inundated with the idea the churches (the physical building as well as adherents to various denominations) preach a wrong (counterfeit) gospel and that church buildings are quite against New Testament teachings. Having only seen and heard Bible teaching from childhood on, these persons who members had begun to subtly encourage to "profess" early in their young lives, have — in this opinion — a particularly unhappy state to live with. Shunned psychologically from those they knew in "the truth"; being placed in a position by others as not having been 'drawn by God to 'profess' and embrace the whole life style as 'the truth', they are shunted to "the world". Stripped of hope in Christ because they did not accept the "package" as laid out to them by workers and adhering family members, they dwell in an often bitter state. For frequently they cannot reason out that turning their back on this no- name group does not mean they lose the hope of salvation through Christ's sacrifice on the cross, or their own personal acquaintanceship with the Bible. Some workers have labelled this step out of the group, a step into the 'natural life' — a life with joys and sorrows but one which leads to a 'lost eternity'. (One worker I queried about where she found the exact phrase 'lost eternity' hedged that it was not mentioned in the Bible in those specific words). To restate the matter, the pathos afflicting those raised in the group, who in their heart of hearts cannot go along with it in their adult years, is acute and often tragic. For them, the choice has been clearly drawn: the way, or the world. This sub-group, the ones that drift out, is left with no spiritual "home". "I never read the Bible any more," said one Norwegian who had drifted out. This person, raised in it, resented among other things, particularly that in the late teens, a worker encouraged baptism (i.e. to make the "choice") to set an example for the younger ones to follow suit. This person could not see the relevance in being baptised in order to promote a sort of follow-the-­ leader-into-the-way idea. This person's children have not been baptised and grow up alongside this parent's bitterness and resentment towards a group that claims the Bible uniquely as its own. A larger part of the picture for those who drift away, is that they are always cast as the errant ones, the ones in the wrong — not the ones wronged. They are disgruntled, bitter, at odds with something they cannot begin to define. Who, after all, is going to argue against the Bible — which is all that is ever used in the group? Who is going to "cast stones" at workers who have always been unfalteringly nice, self-effacing, ever-gracious in their answers and meticulous in their conduct? The ones drifting away must then miserably conclude that it is with he or she, the fault lies. The group has the Bible backing every move it makes. The only recourse is to walk away, confused, in some cases not wanting to touch a Bible again — much in the shameful manner Adam and Eve left the Garden of Eden. One adherent when asked how many children she had replied turning hard, "One daughter". Then it was learned this daughter was "out in the world". The mother's look mirrored rejection of this daughter. A worker sternly brushed off a compliment on the son of members, "Well, he hasn't made his choice yet." This same worker also dismissed a woman married to a group member who had told me once she "lived for the conventions". He said, "She never made her choice", sounding like she was persona non grata to him. Also heard was a female extolling that a member who had fallen away had "made his choice again". She was so happy. The incident renewed thoughts on how this no-name group downplays the concept of being born again to the point where it is rarely mentioned. If members were actually 'born again' that might dispense with an important worker task: to guide a sometimes fumbling, anxiety-ridden, insecure "flock" along the way. Giving his testimony at a summer convention, a man probably in his late 30s, appeared to be in great inner spiritual turmoil. Behind-the-scenes rumors had it that his wife had given him an ultimatum: 'You join this, and I'll divorce you.' Coming into this no- name group demands a virtual rejection of what was heretofore believed in order to accept a new realm of what is heartily proclaimed as "the truth". A marriage partner slips totally out of the world of the other (if she or he does not 'get it') and gets new support and complete sustenance from a world-wide group that is going to show them steps into eternity — while still in this life. ("The signposts are there," said Z-worker with an intimate smile seeming to indicate that there is "geography" in this inner realm and that workers, as a 'parent' figure or 'shepherd' would guide this passage tour....which, of course, takes the entire rest of the life .... with the new adherent starting out "as a child" — a state workers often relish because they are in their prime then ... see IV. THE SERVITUDE). This man, in his 30s, was wrestling it out it appeared, and was in a pathetic state throughout the four days of the convention, at the end of which, he was baptised, signifying he had chosen the group over his wife. One group member claimed to know the man's wife and dismissed her, "She's part of the " religious' world." The wife was in a Baptist-related group. There is a sharp distinction made to the 'religious' world (I mentioned John 3:16 to a group member and there came this reply, "Yes, that is a verse in the 'religious' world, a verse they want to hear") and the reality to members of having heard "the truth" at sometime in their life from "one of God's chosen servants" who go out two by two, owning no property — that, according to enthusiastic group adherents, is the ONLY approach for getting the Gospel out to the world. A certain group member had been "worked over" years earlier by two workers whom this member had given food and lodging to over a long period of time. In the workers' ever gracious manner, they tore down the inner spiritual edifice of this person who had been a choir member and involved in a Baptist-related group. The workers then proceeded to re-build in this person the staunch structure that pleases themselves and which entails sometimes enormous worker labor (who would only say that it was God who did the work, they were just "watering what had already been planted"). Created in the end, was another unyielding defender of "the truth" as promoted by this no-name group which uses no other book than the Bible. This member's marriage partner was totally opposed years ago, but now has acquiesced (although not "in it" per se) probably just to keep some semblance of stability in the family. It (the group ideology) splits the marital union (one woman in it — her husband had committed suicide — another many years ago, decided when she heard the Gospel from workers at an area school house in mid-USA that this was "the truth" and against her husband's pleadings began to embrace it wholeheartedly; they got a divorce and he died a broken man a few years later) without, it appears, much remorse on the part of the workers who laid the groundwork — although often quite unwittingly, believing in great earnest it is--God's drawing ...." Besides alienating marital affections, this group also can split siblings into virtual warring groups ('those in it' and 'those who reject it'). The latter are thus left by the group in an earthly abyss as non sequitor, ever-graciously, politely treated yet psychologically abandoned by the group's collective psyche. Quite by accident, I got in touch with a worker in Norway, because a school acquaintance wrote the woman's address. My only purpose in contacting her was to have a talk — in English — with one who had been in my hometown, and might know a few persons in common. It was neither spiritual need or "God's drawing," as several workers later interpreted it to be. I'd made a strong personal commitment to Christ years before, and had deepest respect for what I deemed a born again experience in 1971, which occurred outside of any denominational affiliation or influence. This school acquaintance's "religion" had never aroused any curiosity in me whatsoever, for this acquaintance always seemed "plugged into" a spiritual world far, far beyond my reach. It was just this point that was used by the Z-worker I had most visits from. Essentially, he drew a picture of this absorbing Christian "spiritual world", a realm where people had been "drawn out" of the masses into "God's heavenly family" on earth. Although putting a critical eye to it all in the initial months, the ever-frequent visits plus being included in the small circle of adherents nearly right away (which led me to assume they were welcoming another Christian amongst them — actually, I learned much, much later this man fully believed he was converting me to Christianity!) absorbed me. These visits were frequent, and in total, 22 other workers also visited my apartment in the suburbs of Oslo from fall 1984 to spring 1985. All of them, it must be said, were respectfully polite guests — took tea, were listeners, or when proper, interjected a thoughtful comment. In retrospect, there were tell-tale things I witnessed and heard that at the time — deep down — I questioned. However, in the flurry of their lovely, embracing acceptance, my inclusion in many social occasions, I put these "things" aside, and began ostensibly (more than ostensibly, I must admit) to accept the party line. Nevertheless, in late May of 1985, I decided to move to northern Norway — one of the reasons being to distance myself from this enveloping group. However, when the Z-worker learned, he arranged for me to be met at the rail station by two workers, where I was driven to the home of one of the very few adherents up in the north (I must say I appreciated this kindness on their part and still do) to live for two weeks until I found an apartment. (I voluntarily paid a liberal sum of money for this).Circumstances led to my coming to southern Norway about three months later to eventually re-settle. "When did you hear the truth?" I looked puzzled. She rephrased it, "When did you hear the Gospels"? I said softly something about having first begun to hear them in the Lutheran Church as a child. She shook her head from side to side, with a look of ludicrousness playing on her face. The placating answer she awaited was when I'd met up with the first worker which was 2 and one half years before. Over the next days, revelation after revelation came throughout day and night, that there was something not right with this group and that it largely centered upon them equating themselves with "the truth". It came so clearly, revealing to me — in the starkest manner — that no group calling itself Christian on this earth, dare breathe the word "truth" as a "name" for itself, as it is the severest of confusion for people the world over who have heard time and again that CHRIST is "THE WAY, THE TRUTH and THE LIFE." It was a travesty of the highest order, to discover I was in a group that, although claiming no name, freely and liberally called itself "the truth". Yet, now I sense a deeper purpose behind the fact I was introduced to this group from winter 1984 to November 1986. Rhetorically, it could be asked: was this experience designed in order that added insight might be given to others, to warn them somehow that the perfection and harmony of this group which ostensibly has no name, masks a fellowship that needs serious re­examining at its core. (1). Refer to Luke 8:18. Take heed then how you hear - and Romans 10:15. 'And how can men preach unless they are sent? As it is written, 'How beautiful are the feet of those who preach good news . 17. So faith comes from what is heard, and what is heard comes by the preaching of Christ'. (2). Ephesians 4:1-4. / therefore, a prisoner for the Lord, beg you to lead a life worthy of the calling to which you have been called, 2. with all lowliness and meekness, with patience, forbearing one another in love, 3. eager to maintain the unity of the Spirit in the bond of peace. 4. There is one body and one spirit. Eph. 5:4. Let there be no silly talk nor levity, which are not fitting. 1 Cor. 16:13. Be watchful, stand firm in your faith, be courageous, be strong. 14 let all that you do, be done in love. Titus 2 (several verses): 3. Bid the older women likewise to be reverent in behaviour not to be slanderers or slaves to drink; they are to teach what is good, and so train the young women to love their husbands and children 5 to be sensible, chaste, domestic, kind and submissive to their husbands ... 7 Show yourself in all respects a model of good deeds, and in your teaching show integrity, gravity and sound speech that cannot be censured. 12 Training us to renounce irreligion and worldly passions, and to live sober, upright, and godly lives in this world ..... to show perfect courtesy toward all men. 1 Cor. 4:6. That you may learn by us to live according to scripture, that none of you may be puffed up in favor of one against the other. Eph. 4:29-30. Let no evil talk come out of your mouths, but only such as is good for edifying, as fits the occasion that it may impart grace to those who hear. * All the above and many more verses, as well, having to do with Christian character and behaviour are much more applicable within the framework of this no-name group. (3). John 15:14. You are my friends if you do what I command you. (4). John 17:17. Sanctify them in the truth; thy word is truth. Jer. 23:29. is not my word like as a fire? saith the Lord; and like a hammer that breaketh the rock in pieces. 2 Tim. 3:15. And that from a child thou has known the holy scriptures, which are able to make thee wise unto salvation which is in Christ Jesus. 1 Peter 1:23. Being born again, not of corruptible seed, but of incorruptible, by the word of God, which liveth and abideth forever. (5). This book, (by Ira Levin) and movie is centered in an eastern town in the USA A newcomer begins to grow suspicious when girlfriends she makes there, who had been full of life and personality, disappear for awhile, only to come back acting robot-like and mechanical in their actions...To her horror, she discovers their insides have been replaced by computer programmed machines making them agreeably pleasant and obedient 100% of the time. 1. It is 89 years old as of 1988. 2. The movement was founded by a Scot, William Irvine, born at Newtown, Kilsyth, Scotland in 1863. 3. To Irvine, the verses in Matthew 10 contained Christ's fundamental rule of discipleship. 5. Irvine believed people must become like Christ in His homeless poverty. 6. The first convention was held at Rathmolyon, about 25 miles from Dublin, Ireland in 1903 (William Gill's farm). d) that they believe that they, alone, were rightful heirs of ancient Christian tradition. AT THE CLOSE OF THE CONVENTION, THE MEN AND WOMEN TOOK VOWS OF POVERTY, CHASTITY AND OBEDIENCE. 7. Irvine believed that only those responding to him and his workers were saved. The idea was that to be saved one must be persecuted. 8. Irvine was not interested in people who preached trust in Christ as the Redeemer of men. 9. Irvine was against everything associated with denominations. His associate for a time, Edward Cooney, took some of Irvine's beliefs and rejected others. They both believed that people led by the Spirit could not be organized. 10. In 1908, Irvine said meetings were to be in homes. The believers were divided into Saints and Workers. 11. Cooney began to say the true church was a person's home. 12. The first convention held in the US was in 1906. The group was started also in Australia at that time. Converts in the US and Australia only heard this group began from the oldest Christians. The sect's beginning in Ireland in 1899 was not mentioned. 13. From the early 1900s beginnings of the sect, church buildings and established churches were spoken against by workers. 14. Once a no-name group is established, it is taught to the 'converts' that they are exclusive — they are "in the truth" or "on the way". These converts must cut church connections. 16. In Canada, the workers were known as "Two by Twos", and the movement made a lot of converts especially in the 1930s. 17. People were taught they were the "only Christians". It is serious fiction for any of these people to say they originated from New Testament times. This deception hides the true historical origin from 1899 and leads people in the wrong 'way' in embracing the religious ideas of a few men led at first by Irvine, then Cooney, Reid, Weir. These men had social prejudices which are against what the Bible says. Since the basis of this was a falsehood in telling people this movement had origins that it certainly did not have, then what has been built on this erroneous foundation results in a serious mis-use of the Bible. Ideas have found their way into this movement that are in opposition to the Christian doctrine of the shed blood of Christ, what happened at the Cross, as THE redemptive act for ALL who call upon Christ and seek to do His will. Christ says, "I AM THE WAY, THE TRUTH and the life." No group on this earth has the right to call itself 'the truth', or claim exclusive rights to the message. William Irvine, founder of the Movement which later became, after a split, "The Cooneyites" and "The Two by Two"' was born near Kilsyth, Scotland, professed faith in Christ under the preaching of the Rev. John McNeil, renowned Presbyterian evangelist of the last Century, joined the Faith Mission (an evangelical, interdenominational Mission to evangelize the country districts of the British Isles, founded by John George Govan in or about 1896 or 7. Irvine became District leader for the work of the Faith Mission in the south of Ireland — what is today the Republic of Ireland. Irvine felt that the 'converts' gained in Missions were not being nurtured and became anxious about the cause. He partly blamed the churches, but finally concluded that the fundamental reason was that they, the preachers, were not going out as Jesus said, according to Matthew chapter ten and Luke chapters nine and ten. This 'revelation' seemed to hit Irvine like a bolt of lightning. By 1899 he was working according to the instructions and injunctions given to the twelve and the seventy in the above passages of Scripture, and the Movement was born. Celibacy in the Irvine Movement, if not absolutely insisted upon, is practically so. This, in itself, throws light from an unerring source upon the origin and motivation of the whole Movement. Accordingly he went to Jerusalem, lived and died there — no dramatic resurrection, however. A false prophecy! (See Deut. 18:22). Doubtless this was after Irvine split from the Movement he had founded. However, this was still the man who gave the Movement birth and set its sails both in doctrine and in practice. Our Lord in these passages is giving both the Twelve Apostles and the Seventy authority to heal, cast out all demons, and raise the dead, plus a commission with detailed instructions. It was to be an urgent, brief, mission: "I tell you the truth, you will not finish going through the cities of Israel before the Son of Man comes" (Matt. 10:23). They were specifically NOT to go to the Gentiles (nations) or to the Samaritans, but ONLY to "the lost sheep of the house of Israel" (6). They were to take no money, no bag, no extra tunic, or sandals or staff....they would get their keep (9,10). They were to seek out 'worthy' persons with whom to stay. The Seventy were sent out by Jesus "two by two ahead of Him to every town and place where He was about to go" (Luke 10:1). 1. The disciples and Apostles were NOT TO GO TO THE GENTILES — only to Israel. *** The "Two by Two's" GO to the Gentiles (nations) — Ireland, USA, etc. 2. The Matthew and Luke commission included healing the sick, casting out demons, and raising the dead: these miraculous signs they performed literally, not figuratively, (see Luke 10:17). ***Neither Irvine nor any of his successors performed such miracles, nor, as far as I am aware, ever claimed to do so. 3. The Commission was a temporary one and was later rescinded (see Luke 23:35,36). ***The "Two by Two's continue to apply the revoked instructions of our Lord — thus turning the word of God into the commandments of men. 4. The specific command to the Seventy to go out "two by two" obviously ceased when the mission was completed, which was in a short time (Matt. 10:23). ***The "Two by Two's" carry over this temporary Divine command and make it a law for their workers today. This to them, is "living the Gospel". But see how Peter was at Joppa ALONE (not "Two by Two") when sent for by Cornelius (Acts 10). Philip was chosen (Acts ch. 6) because he was full of the Holy Spirit, and he later went ALONE to preach to the Samaritans (to whom the 70 were forbidden to preach). He also was sent by the angel to meet the Ethiopian in the desert ALONE. He returned preaching in many towns and villages ALONE .... and by the leading of and power of the Holy Spirit Paul preached in Damascus ALONE and later was sent to Tarsus ALONE (Acts 9:19-30). The book of Acts is full of accounts of preachers going alone, in twos, threes, fours and even sevens and eights. The Great Commission, in fact, laid down NO RULES as to the numbers who must go out preaching the Gospel (Matt 28:18-20). Irvine's 'revelation' that all was to be based on Matthew chapter 10 has led his successors to the belief that their preachers ALONE are "living the Gospel" as Jesus commanded: that they ALONE are preaching the Gospel as Jesus commanded: that ONLY those who respond to the message their preachers are bringing are true Christians: that the preachers must search out "WORTHY" persons — when in fact the Lord commends His love toward us in that He died for SINNERS, and it is only the "poor in spirit" who have the Gospel preached to them (Luke 4). Jesus came "to seek and to save THE LOST," and He said to the disciples (and to us), "As the Father sent me, even so send I you". Irvine's 'revelation' has led to the erroneous belief that the CHURCH MUST BE IN THE HOME and the PREACHER MUST BE WITHOUT A HOME: it has, by this dogma, fed the fires of bitterness and vehement hostility toward all Churches and their adherents: has produced in the preachers a superior view of themselves — a Pharaseeism of the most spiritually dangerous nature imaginable — and in the rank and file members an isolation and exclusiveness wholly unscriptural and damaging. It has resulted in the DOGMA of the unpaid preacher — that it is WRONG even to sell a Christian book! All this contrary to the plain example in Holy Scripture of Paul "taking wages" from some churches so that he could preach for nothing to others, and his inspired statement: "Let him that is taught in the word COMMUNICATE TO HIM THAT TEACHETH in all good things" (Gal. 6:6). This order is termed a "right" (1 Cor. 9). Paul FREQUENTLY received support from the Church at Philippi (Phil. 4). Finally the 'revelation' has resulted in the Movement bearing the marks of a Cult — an authoritarian leadership, secondary matters being elevated to positions of primary importance, exclusive self-centeredness to the neglect of doing good to ALL MEN (see the Good Samaritan Luke 10: 25 .37), and the stultifying and distortion of the Great Commission to preach the gospel to every creature, which is the most urgent business of every believer in Jesus. The lives of those who carry the Gospel message are of vital importance. God commands, "Be ye holy, for I am holy". No apparent holiness of life, however, can compensate for the preaching of a different or defective Gospel (Gal. 1:8,9). What is the Gospel? It is the good news of the finished work of redemption accomplished for us by God in Jesus Christ (see 1 Cor. 15:1-5). He shed His precious blood that, in Him, we might have redemption — the forgiveness of sins (Eph. 1:7). How does the benefit of the Gospel become ours? Through faith! "Therefore being justified by faith we have peace with God through our Lord Jesus Christ." Read carefully Romans 4:23-25; 5:1. What is justification? It is a judicial act of God — "It is God that justifies" (Rom. 8). He justifies the guilty sinner who believes in Jesus — and is just in doing so, for Christ paid the debt (Rom. 3:26). The believing sinner is not only forgiven for Christ's sake (1 Jn. 2:12) but the righteousness of Christ is imputed to him (Rom. 4:16, 24). Do the 'Two by Two's' preach this Gospel? From my experience more stress is laid upon the identification of the preachers (workers) with the Apostles and evangelists of the New Testament, than upon the content of the message which they brought. Yet Apostolic doctrine is absolutely crucial. As well as lack of accurate content in their message, the "Two by Two" preachers very largely confuse and mingle justification with sanctification. Justification brings assurance of salvation because Christ's work is complete and perfect, and has been accepted by God who justifies: the sinner has no work to do (Romans 11:6). If we had the least work to do we could never be sure we had done it perfectly. The Perfect One has redeemed His people! He sends the Spirit of Adoption into our hearts crying, "Abba Father", not because we work or strive to keep rules, written or unwritten, but because we believe the message of the Gospel (Gal. 3:2; 4:6; Rom. 8:15). My friend — believe and live! Being justified the believer's faith functions through love. He desires to serve God out of sheer gratitude for what He has done for Him. 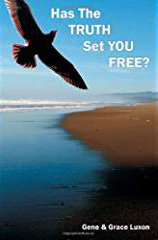 He is exhorted to work out in his life what the Holy Spirit works in his life (Phil. 2). This is sanctification. The word is always above the Church, preachers and people alike, for it is with the word that God creates the Church (Ja. 1:18). Here the "Two by Two" preachers, elevating themselves above the word of God, make a calamitous blunder. They are indispensable! " You will never get to know the truth through the exposition of the Scriptures. It is the preachers going out as Jesus sent them…" stated one of their workers in my hearing. Not so! Charles Wesley, for example, was converted to Christ through reading Martin Luther's commentary on Galatians 2:20. Many have been converted through reading the Holy Scriptures alone, without the aid of any man or men. Hear the rebuke of the Spirit! "Who then is Paul, and who is Apollos, but ministers by whom ye believed, as the Lord gave to every man? I have planted, Apollos watered; but God gave the increase. So that neither is he that planteth any thing, neither he that watereth: but God that giveth the increase." (1 Cor. 3:5-7). "The wind blows where it pleaseth, and you hear the sound thereof, but canst not tell whence it cometh, or whither it goeth; so is every one that is born of the Spirit" (Jn. 3). (B-1) Jack Carroll, Western U.S.A. overseer, wrote of Wm. Irvine, "He is under the awful delusion that he is one of the two witnesses of Revelation eleven, ...." (Cited from 'The Secret Sect', p. 65). (B1A. Magowan attributed Wm. Irvine with stating, "... I AM one of the two Witnesses!...." (Cited from 'The Secret Sect' p. 113). See also Wm. Irvine's own written statement ibid. p. 111. In Luke xxii. 35, 36, we read: " And He said unto them, When I sent you without purse and scrip and shoes, lacked ye anything? And they said, Nothing. Then said He unto them, But now, he that hath a purse, let him take it, and likewise his scrip: and he that hath no sword, let him sell his garment, and buy one." Let us contrast two explanations of this passage.
" ' But now' (v. 35). The Saviour says the times are changed. Before, he sent them out only for a little while. They were in their own country. Their jour­ neys would be short, and there was no need that they should make preparations for a long absence, nor for encountering great dangers. But now they were to go into the wide world, among strangers, trials, dangers, and wants. And as the time was near: as He was about to die; and as these dangers pressed on; it was proper that they should make provision for what was before them. . . . They should now take money, as it would he necessary to provide for their wants in travelling 'a sword' . . . It should be remembered that these directions about the purse, the scrip, and the sword were not made with reference to His being taken in the garden, but with reference to their futurelife. The time of the trial in Gethsemane was just at hand. Nor was there time then, if no other reason existed, to go and make the purchase. It altogether refers to their future life. They were going into the midst of dangers. The country was infested with robbers and wild beasts. It was customary to go armed." "But now, now that ye are going to backslide, now that Peter is going to deny Me, and go back to his fishing; now that ye are all about to forsake Me and flee because that ye are fools and slow of heart to believe (John xxi. 2, 3; Luke xxiv. 25): he that hath a purse let him take it, and likewise his scrip, and he that hath no sword, let him sell his garment, and buy one. Verse 38 shows that they had gone so far wrong as to provide themselves with two swords, which they were probably hiding from the eyes of Jesus, but He knew their hearts, and when they produced the swords, said, 'It is enough,' meaning it is enough to show you have lost confidence in Me and My Father. It is enough to prove your backslidden condition. (1) When He told the backslidden disciples to take purse, scrip, and sword it was because they had the heart to do it— 'He gave them the desire of their hearts and sent leanness withal into their souls,' etc." It would be hard to beat this for a specimen of a palpably absurd (one is tempted to use a much stronger word) "interpretation" of the words of Holy Scrip­ ture, but the "destitute-go-preacher" theory was in desperate peril, and had to he rescued at all costs, even by turning our Lord's plain meaning upside down! No wonder such "interpreters"! have to he backed up by the "entrusted by Jesus with the interpretation of Scripture" theory! But perhaps it might be thought that the original instructions of Matt. x. and Luke x. were afterwards renewed by the Apostles, under the direction of the Holy Spirit. We have two epistles of St. Paul to Timothy, and one to Titus, which relate mainly to the offices of the ministry. The Cooneyites claim that all the Apostles were so. St. Paul is their favourite example. They are very fond of quoting the different passages where he speaks of his vicissitudes. (1) The words, "It is enough," would seem to mean simply, "I have said enough now; "for immediately follow the words, "And He came out and went to the Mount of Olives." (2) Hardly necessary to say that, "Not greedy of filthy lucre," is quite a different thing from "Provide neither gold, nor silver, nor brass in your purses" (Matt. x. 9).